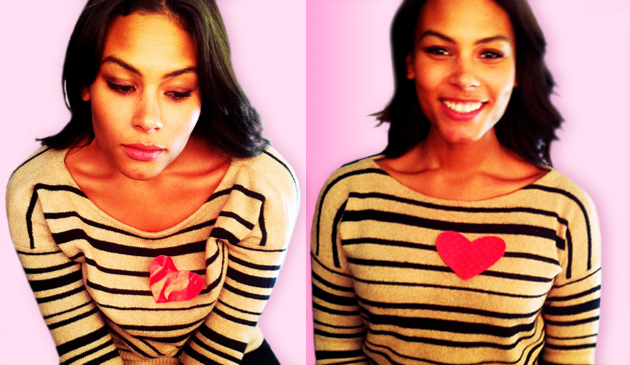 The beautiful model, Marquita Pring, demonstrates what happens to our pumper when we’re slouched. This post isn’t so much about the heart, or about Valentines Day. However, since the holiday just passed, it got me thinking about the heart, as well as other internal organs. It also got me thinking about what makes a stranger appear attractive, which led me to think about posture. Then I envisioned what happens to a heart when a body is slouched over. It must get all compressed, right? All our organs must just squish together when we slouch. Not only is slouching bad for us on the outside, i.e. how it makes us appear, as well as the effect it has on our spine, but it’s got to be bad for us on the inside then, too. So how’s your posture right now? Is your chin parallel with the floor? Are your ears, shoulders, and hips in one line? Are your feet planted evenly on the ground? Are your shoulders relaxed away from your ears, with your shoulder blades reaching towards one another, gliding down your back? Yeah, me neither. Try this little exercise to get in alignment: push your shoulders forward, then bring them straight up, then straight back, then straight down. Does it feel good? Does it hurt? I can’t tell you how often I say to the models in my makeup chair “sit up really straight”, or “get really tall for me now”, and even “do you see how slouched you are right now?” I guess it’s a sign that they’re really relaxed, which makes sense because I always give a little face massage to get them feeling good and ready for me to hold their faces hostage while I paint on them. I mean, we all know that most models have great posture when they’re being photographed. The way they hold themselves has a lot to do with our perception of how attractive they are, and ultimately how attractive they’ll make the item they’re selling appear. Good posture is innately attractive. When I was a kid, my dad used to do that thing where he ran his fingers down either side of my spine to remind me to stand up straight. Just looking at him was usually enough of a reminder; my dad has the best posture, and luckily he passed that on to me and my brother. Thanks, Dad! You will breathe better! This oxygenates your entire body, giving you a more sharp and clear mind, better motor skills, and an improved mood. This is why yoga and meditation are all about the breath. You’ll avoid numerous health complications like slipped and herniated disks, backaches, poor blood circulations, neck pain, headache, and poor muscle control. You’ll improve your image in the eyes of others, and you’ll feel better about yourself. You know it’s true: people with good posture look more confident and therefore more attractive. You’ll notice the difference in how others relate to you pretty immediately. You’ve heard it before, but it’s a good one: envision a string that begins in your spine and exits through the crown of your head, leading towards the ceiling. Focus on keeping your spine and head aligned with the string while relaxing other parts of your body. Stomach muscles should be engaged, but not sucked in too tightly that they constrict you taking in a full breath. a. Stop sitting on the edge of your seat! Put your bum all the way to the rear of your chair, where the seat and the back rest meet. b. Get a good quality chair and a back cushion if you’re sitting at a desk for more than an hour a day. c. Ground both of your feet while standing or sitting. Are both of yours on the floor right now? d. Engage in activities that are good for your back: pilates, yoga,stretching. Lighten your load! Stop carrying heavy purses and shoulder bags on one shoulder. Your poor shoulder! Try thinning out the contents and move the essentials into a bag that you wear across your body. Don’t allow your technology to round your shoulders. Make sure your computer screen and keyboard are at a height and angle that contributes to good posture, and always hold your smart phone at face height and keep your shoulders back and down while texting. You may think it looks stupid, but you won’t be the one with neck and shoulder problems! Finally, treat yourself to a head, shoulder, or back massage as often as possible (could be from a friend, but preferably from a trained professional). Retraining yourself to have good posture is exhausting and generally hurts for the first little while. At the very least, give yourself a massage by laying on the floor ,on your back, and gently rolling yourself over a tennis ball, concentrating on the stiff parts. There are countless web sites dedicated to teaching you how to achieve good posture through step by step directions. You can take your pick from written, pictorial, and video instructions. If you’re not 100% sure you’re employing good posture, come on, what are you waiting for? Your heart and your lungs to fuse into one?